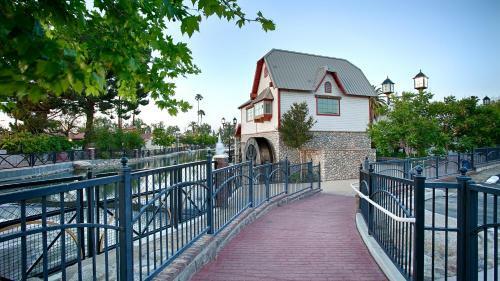 Find places to stay in Bakersfield, CA and other fun things to do. View our list of attractions, activities, events, restaurants and visitor information. With Wi-Fi and parking a heated indoor pool a hot tub east Bakersfield access to nearby Lake Isabella and super budget-friendly prices guests can rest easy at the non-smoking Americas Best Value Inn and Suites. Swimming Pool, Indoor Pool, Pets Allowed, Non Smoking Rooms. Complimentary Wi-Fi parking and breakfast as well as fitness facilities and a central Bakersfield locale are highlights on the list of amenities at Ramada Limited Bakersfield Central. Free Internet,Outdoor Pool, Pets Allowed, Non Smoking Rooms. Currently as low as $50.40/night! Complimentary Wi-Fi parking and breakfast an outdoor pool and free movie channels are highlights on the list of amenities for wallet-conscious guests at the Bakersfield Inn. Free Internet,Outdoor Pool, Non Smoking Rooms. Flat-panel HDTVs a pool and a restaurant head the long list of amenities at the non-smoking Bakersfield Marriott at the Convention Center. Free Internet, Swimming Pool,Outdoor Pool, Restaurant, Non Smoking Rooms. Located in Bakersfield a 12-minute walk from Crystal Palace and Museum Bakersfield River Run RV Park provides accommodation with free WiFi a garden with an outdoor swimming pool and access to a hot tub and a fitness room.The campsite offers a barbecue. Free Internet,Outdoor Pool, Pets Allowed. Best Economy Inn & Suites offers free WiFi and rooms with air conditioning in Bakersfield. The property is set 3.7 km from Crystal Palace and Museum and 6 km from Fox Theater. The accommodation provides a 24-hour front desk. Free Internet,Outdoor Pool, Pets Allowed, Non Smoking Rooms. Comfy amenities including free parking and breakfast in-room microwaves and mini-fridges and ceiling fans top the list of popular faves at the non-smoking Best Western Heritage Inn located in the Nashville West of California. Free Internet, Swimming Pool,Outdoor Pool, Free Breakfast, Pets Allowed, Non Smoking Rooms. Free breakfast complimentary internet a year-round pool and proximity to I-5 are highlights at the Best Western Liberty Inn. All 61 rooms at the two-story Best Western come equipped with free high-speed internet cable TV and coffeemakers. Free Internet, Swimming Pool, Indoor Pool, Non Smoking Rooms. Free Wi-Fi a pool and complimentary parking are included in the amenities our guests enjoy at the pet-friendly Best Western Plus Hill House. Free Internet, Swimming Pool,Outdoor Pool, Restaurant, Pets Allowed, Non Smoking Rooms. Currently as low as $89.96/night! Free full breakfast and suites with high-speed internet access and microwaves make it easy to crash at the non-smoking Comfort Suites Bakersfield. Free Internet,Outdoor Pool, Non Smoking Rooms. Breathe in the fresh amenities including free Wi-Fi and parking morning meals and home-style conveniences at the Garden Suites Inn Bakersfield. Free Internet,Outdoor Pool, Pets Allowed, Non Smoking Rooms. Easy highway access free Wi-Fi and parking balconies or patios and a hot tub top the list of modern amenities offered to our guests at the non-smoking Courtyard By Marriott Bakersfield. Free Internet, Swimming Pool,Outdoor Pool, Restaurant, Non Smoking Rooms. Currently as low as $37.60/night! Our guests enjoy the free Wi-Fi and parking in addition to recreational fun that includes a hot tub at the Days Inn Bakersfield located two miles from Rabobank Arena.Outdoor Pool, Free Breakfast, Restaurant, Pets Allowed, Non Smoking Rooms. The pool billiards sports court and dance floor double the fun with free parking and shuttle service at the non-smoking DoubletTree Hotel Bakersfield. Swimming Pool,Outdoor Pool, Non Smoking Rooms. Currently as low as $46.39/night! An outdoor pool with a hot tub free breakfast and free Wi-Fi make it easy to stay on budget at the Econo Lodge Bakersfield off of Highway 99. This two-story hotel has 60 rooms with cable TV free Wi-Fi mini-fridges microwaves and coffeemakers. Free Internet,Outdoor Pool, Non Smoking Rooms. Featuring a bar Executive Inn & Suites is located in Bakersfield. The property is around 7 km from Crystal Palace and Museum 9 km from Fox Theater and 9 km from Buena Vista Museum of Natural History. Free WiFi is available. Free Internet, Non Smoking Rooms. Free Wi-Fi kitchens and guest laundry facilities make for a comfy base of operations at the pet-friendly Extended Stay America Bakersfield - California Avenue. Free Internet, Free Breakfast, Pets Allowed, Non Smoking Rooms. Currently as low as $71.24/night! Free Wi-Fi kitchenettes guest laundry facilities and a fitness room make for a cozy base of operations at the pet-friendly Extended Stay America - Bakersfield - Chester Lane. Free Internet, Free Breakfast, Pets Allowed, Non Smoking Rooms. Located just 1 block away from Buck Owens Crystal Palace this Bakersfield motel features an outdoor pool. All rooms include a cable TV. Free guest parking is available.Each air-conditioned guest room at EZ 8 Motel Bakersfield provides a refrigerator.Outdoor Pool, Pets Allowed.